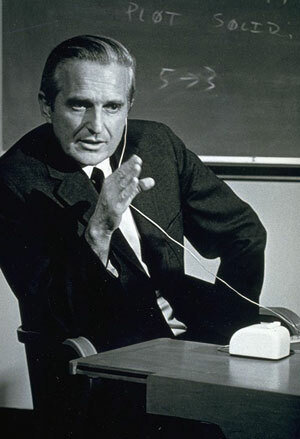 The name of the prominent American inventor and computer pioneer Douglas Carl Engelbart (biography of Douglas Engelbart) has already been mentioned several times in this site (see the first computer mouse). Here we will mention only his system NLS as a first working hypertext system. In the late summer of 1945, at the very end of World War II, a young 20 years old US Navy radar technician in the Philippines—Douglas Engelbart, went to the local Red Cross library and picked up a copy of the Atlantic Monthly journal from July, 1945. There he stumbled upon an interesting article, namely Vannevar Bush's work As We May Think, presenting his "memex" automated library system. The young Douglas was profoundly influenced by the Bush's vision of the future of information technology. In 1950s Engelbart started developing Bush's ideas, extending them in the broader field of something, which he will later on call Augmenting Human Intellect. In 1957 he joined the Stanford Research Institute and in 1962 started work on Augmenting Human Intellect: A Conceptual Framework. It was a project to develop computer tools to augment human capabilities, for “boosting mankind’s capability for coping with complex, urgent problems”. In October, 1962, Engelbart published his own version of Bush's vision, describing an advanced electronic information system in the paper "Augmenting Human Intellect: A Conceptual Framework" (see the paper "Augmenting Human Intellect"), prepared for the Air Force Office Of Scientific Research and Development. In this article he mentioned: Most of the structuring forms I'll show you stem from the simple capability of being able to establish arbitrary linkages between different substructures, and of directing the computer subsequently to display a set of linked substructures with any relative positioning we might designate among the different substructures. You can designate as many different kinds of links as you wish, so that you can specify different display or manipulative treatment for the different types. In the same 1962 Engelbart hired a small team of researchers to develop a demonstration hyper collaborative knowledge environment system called NLS (for oNLine System), first published (see the article for NLS) and publicly demonstrated in 1968. NLS system is difficult to describe, since it is a very richly comprehensive environment of tools and practices for facilitating any scale of heavy knowledge work. Engelbart used NLS for all its own knowledge work, from drafting, publishing, email, shared screen collaborative viewing and editing, document cataloging, project management, shared address book, and all source code development and maintenance—all in an integrated hyper groupware environment, filled with many special features for high performance work. For example, the user can create a link to any paragraph or line of code or email paragraph, and he can see when paragraphs and lines of code were last edited and by whom, and even view a file filtered by author since a certain date and time (as in why doesn't the code work this morning, let's see who was in there changing what when! ), he can browse with outline views, drill down into the structure of a document or source code and fly around with a number of precision browsing features and custom viewing features, and edit the structure as well as the text, within and across files and application domains. Engelbart continued to evolve NLS under real world usage with a team of up to 47 researchers in his lab at SRI, cultivating a networked community of early customer IT pioneers via the newly formed ARPANET.